Revise text. 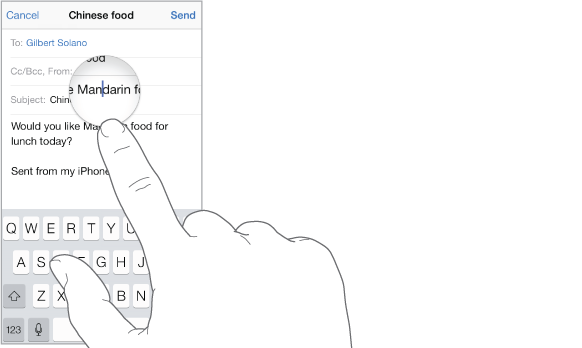 Touch and hold the text to show the magnifying glass, then drag to position the insertion point. Select text. Tap the insertion point to display the selection options. Or double-tap a word to select it. Drag the grab points to select more or less text. In read-only documents, such as webpages, touch and hold to select a word. You can cut, copy, or paste over selected text. With some apps, you can also get bold, italic, or underlined text (tap B/I/U); get the definition of a word; or have iPhone suggest an alternative. Tap to see all the options. Undo the last edit. Shake iPhone, then tap Undo.